Our stickers and labels work best on a clean, smooth, flat surface free of debris. If you have any concerns about whether or not the stickers will work on your surface, please see our Product Quality section. If you're still unsure, you can request for a FREE sample package. 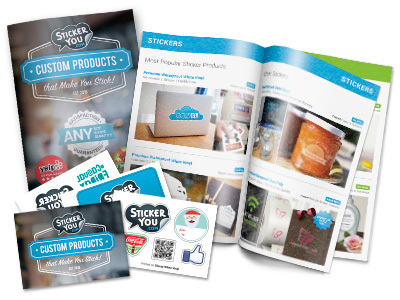 The sample packages contain a product catalog as well as a booklet with sticker samples in different materials for you to test out the application and behavior of our products. Please keep in mind that due to the volume of requests , we do not offer custom design samples, but with our no minimum order requirement, you can easily order a single page of your design to see how your creation looks! Want to know how to get one ? You can view and download our new catalog and fill out a sample request form here and we will be happy to send one your way!